Social Security is a Georgia based audio collage duo featuring the talents of Joe Scagnetti and E. Robert Frank. They've contributed tracks to compilations such as The Droplift Project and Free Speech For Sale, and Frank also works on a project under the name Digital Poodle, which he calls The Great Directors. The project is based very loosely on the careers of five well-known film directors, for no other reason than the fact that Frank needed a non-personal subject on which to write lyrics. Both Poodleface and Social Security claim an interest in the Absurd as a primary motivating factor. *Are there any additional names used to describe this project: I performed some of our Social Security material solo at the Atlanta Laptop Battle as El Hadron (accent over the o). *Do you use a pseudonym? Both band members use multiple pseudonyms. 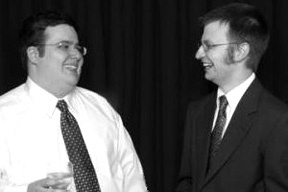 *Founding Members: Joe Scagnetti and E. Robert Frank (these are our main pseudonyms). *Tape manipulations, digital deconstructions or turntable creations: I just call us "audio collage,” but primarily our work is done with digital wave editing, supplemented by anything else we feel like (guitars, synths, tape squeals, AM radio, feedback). *Another genre descriptor: We don't have any of those fancy nicknames for our music. *Location: Atlanta, started while we were both at Georgia Tech. What is your creative/artistic background: I grew up with a music-loving mother who had me playing piano (at first accordion) at an early age. I believe that I had some raw musical talent, but a lack of attention span made me a very poor student. I had lessons off and on but quit before I even got to high school. I also made an abortive attempt at guitar lessons in high school, but I don't think my stubby hands will ever allow me to "unleash the f**ing fury" like that. However, I have been a computer geek since elementary school, and I have always enjoyed creating things. In fact, I have a bit of a complex where I can't just passively enjoy a hobby and have to become a creator as well. This applies to just about anything I enjoy, from video games to crossword puzzles to music to comedy. While in high school, I was in the BBS scene. In those download areas, I stumbled onto .MOD files and had to start making my own songs with ScreamTracker. Later in college I moved up to wave file editing with CoolEdit. Nowadays all the kids love their fancy toys like Ableton Live and Reason but I pretty much stick to CoolEdit or custom code that I've written. I do want to learn Ableton though... Rob (the other band member) has been in a large number of bands since he was a teenager, many of them traditional rock but always with a bit of a weird twist. He is an excellent guitar player, and his musical ability carries over to just about any instrument he picks up. He uses keyboard synths quite a bit now, and I believe he is completely self-taught there, but he's still better than me. He is also excellent at constructing electronically, and he has been focusing on audio/video collage songs including original music. Most of this he does under the name Poodleface. Also he was on American Idol once. *History: The first Social Security track was made in 1998, I believe. So 10 years now. *Born: We were both born in 1978, a few months apart. I grew up around Fort Lauderdale, FL, and he grew up in Macon, GA.
*Motivations: The aforementioned creative complex compels me to grab the steering wheel. I get a thrill like no other when I feel like I have created something of value, no matter what it is. I have a favorite quote by Albert Camus which says, "The absurd joy par excellence is creation." Another quite good one from Nietzsche: "We have art in order that we do not die of the truth." I mean it quite literally when I say that to me the purpose of life is creating things (perhaps followed closely by comedy). *Philosophy: I'm not sure you could say there is much of one, other than to create and to have fun. We were influenced by Negativland and other audio collage greats who tend to recontextualize samples to make social comments, which is definitely something we like to do as well, but that is not the entirety of what we do. Sometimes you just want to combine sounds because they work well together or perhaps form something absurd. I can say though that our name is meant as a sort of joke. Obviously the phrase "Social Security" has a certain connotation due to that crusty old government program that is falling apart (which is another joke in itself), but when we chose it as our name we intended it more as the concept of feeling secure in social settings (e.g., buying clothing from the right designer or getting the stylish haircut). This ties into the themes of cultural hypocrisy and the advertising machine which we enjoy referencing with the sources we sample. *How would you like to be remembered: If we're remembered at all it would be no minor accomplishment. We are a relatively unknown, non-prolific group. That said, I personally would like us to be remembered as the greatest band that ever existed, as well as the ones who brought peace to the Middle East.